So you have decided that $200 is the maximum you are willing to spend on a pair of binoculars? Well, I don’t blame you. Because let’s face it things aren’t so good financially for most of us. Thus restricting your binocular budged to $200 makes a lot of sense. 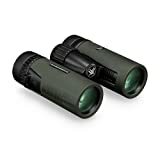 Needless to say, do not expect to find a Swarovski grade binocular such as rangefinder binoculars in this price range. Nonetheless, you’ll want a dependable and reliable pair. After all, $200 is still a lot of money even in this economy. The best binoculars under 200 should offer great value for your money. Sadly, not every binocular in this price range deserves the title of best-hunting binoculars under 200. With that being said join me as I comb through the under $200 price range for the best budget binoculars. From a list of about twenty different binoculars, I have selected eight to feature on my list. I have selected this eight based on what they offer given their price tags. I have also taken to the liberty of testing some of them and getting personal opinions from users. So you can expect an in-depth review of each of my top eight best budget binoculars. I have also included a buying guide to help you when shopping for a binocular in this price range. There are a number of reasons why I selected the Celestron 71332 Nature DX binocular to top my list. Affordability is of course top on my list of reasons. Priced at below $150 it is one of the cheaper models out there especially for beginners. Something I absolutely loved about this binocular is how easy it is to focus. In my experience binoculars priced at below $150 usually, feature a pretty crappy focus knob. This is not the case with Celestron as its focus knob slides back and forth smoothly. But where it truly shines is in the optical department. Bak-4 prism lenses offer more contrast and field of depth compared to Bak-7 prism lenses. So you can expect an exceptional image quality with good contrast. To top it all off despite its budget tag it comes with fully multicoated optics. Meaning that more light enters the binocular. This translates to brighter and clearer images. The 8X magnification and 42 mm objective lens are decent. However, I did notice some blurring, especially when zoomed to maximum magnification. This blurring can make viewing the finer details of your target problematic. Nonetheless, given its price tag, this minor drawback is understandable. In 2013 Nikon discontinued the popular Nikon Prostaff 7 series of binoculars. In its place, the manufacturer introduced the Nikon Prostaff 7s. As a result, the 10x42 variant of the Prostaff 7 has been replaced by the Prostaff 7s 10x42. So is the new Prostaff an improvement on the previous model or should Nikon have stuck with the Prostaff 7 without the s? Well, I recently got a chance to try on this new model, and I have to say I was impressed. For starters thanks to the rubberized armor that coats the binocular’s exterior it feels solid. Also, it is unlikely that it will get damaged from a few knocks or bumps. In regards to image quality, it has phase corrected coated roof prisms. This means that color reproduction is excellent and images looked clear and with good contrast. Also, similar to the Celestron the new Prostaff has fully multicoated lenses. And as you would expect images appear bright and with good resolution. As its name suggests, the Prostaff 7s maintains the 10x magnification and 42 mm objective lens combo of its predecessor. And I loved the turn and slide eyecups. These make it easy to adjust the eye relief, which is not something you see in budget binoculars. Being one of the best cheap binoculars around, it is of course fog proof and waterproof. Also, it comes with Nikon’s lifetime warranty. What I did not like about the Prostaff 7s was the strap, which is short and could use some additional padding. However, you can always buy a new strap if the one it comes with does not excite you. When I think about top-rated binoculars Vortex is a name that always pops into my mind. And in particular the Crossfire series. There are quite a number of awesome binoculars in this series with the 12x50 crossfire being one of my favorite. Compared to others on this list this Crossfire bino is quite big. Its 12x magnification is complemented by a 50mm objective lens. This translates to an impressive field of view of 273 ft at 1000 yards. And just like the Celestron and the ProStaff, it has fully multicoated optics. Which when combined with the huge objective lens make for a fantastic experience. Especially in low visibility conditions. The twist-up eyecups make things easy for both glass wearers and those like us who do not need glasses. While its design and rubber armored exterior make it easy to grip even with wet hands. In essence, this is one of the b best-rated binoculars in Vortex’ catalog. And while it is bigger than some other entrants on this list, it is well worth considering. One of the best bird watching binoculars under 200 the Nikon Aculon 10-22x50 zoom has a rather traditional design. But do not let this discourage you as it offers good value for money. Similar to the other binos on this list it will cost you less than $200 to buy one. But is it really worth it considering it is a Porro prism binocular? Well, for birdwatching it is perfect. One of the Aculon’s selling points is the variable magnification, which can be adjusted from 10x to 22x. This means you can use for almost anything from casual bird watching to night-time star gazing. The fully multicoated optics on this model are stepdown from the fully multi-coated optics of others on this list. Nevertheless, it is a Porro prism meaning it requires less coating than other binos. The external lens surfaces have anti-reflective coatings that prevent unwanted lighting from interfering with your birdwatching. And with the large 50mm objective lens the images are also sufficiently blight. Users of this product have complained of blurring and color aberrations when -set to higher magnification levels. So do not expect the image quality that you have come to expect from pricier Nikon Binos. All the same, the Aculon is a fantastic pair of binoculars. 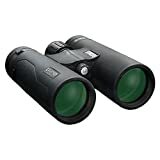 In 2013 the Bushnell Legend L-series 10x42 was voted the best 10x42 binoculars under $200 by the good folks at binoculars.com. Being the binocular enthusiast that I am, I decided to buy myself a pair. And for the last six or so years, my 10x42 has served me well. Firstly, this is an extremely lightweight binocular that has smooth contact grips on the side. But where it truly shines is in the optical department. Compared to the cheaper Legend E series the L-series has a significant advantage. The Legend 10x42 uses the tested and proven ED glass that is lead-free. This glass reduces chromatic aberrations that occur when light passes through the lenses. The result is that there is little to no color fringing when looking at objects. To further improve the image quality, this binocular comes with fully multicoated optics. This combined with the ED glass guarantee sharp and bright images. While the 10x magnification and 42 mm objective lens deliver a good enough field of view. A large focus wheel that is centrally positioned makes it easy to focus this binocular. Also, there is a diopter on the right eyepiece for adjusting eyesight. Unlike in the cheaper E series, the diopter on this model is lockable. The binocular is water and fog proof and has a rubber coating covering its exterior. This rubber armor gives it sufficient protection against knocks and bumps. The Nikon Prostaff 3s 10x42 is one of the more compact offerings from Nikon. Equipped with a 42 mm objective lens and a fixed 10x magnification it is suited for the average outdoorsman. Apart from being lightweight, it is also affordable. It is actually the most affordable binocular on my list so far. So does this mean it is outclassed by its competitors? Well compared to others on this list, it is not the best birding binoculars under 200. However, it has features rarely found in binoculars in its price range. 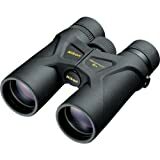 Weight about 20 ounces the Prostaff 3s binoculars are incredibly lightweight. In addition, it has a great field of view of 367 ft at 1000 yards. This is thanks largely to the 10x magnificent and 40 mm objective lens. When it comes to optical performance, it lacks the fully-multicoated optics of its pricier counterparts. Instead, it makes do with a silver prism coating on the prisms that reduce glare and enhance brightness. Obviously, this coating is for cheap binoculars, but it does not disappoint. Especially since Nikon stuck with the ED glass on this budget offering. As for the exterior, it is waterproof and has a rubber outer armor. Another Vortex bino that makes it on my list is the 8x32 variant of Vortex’s Diamondback Optics. With an 8x magnification and 32mm objective lens it has a very wide field of view. Its field of view stands at 420 ft at 1000 yards. But its wide field of view is not the only thing that earned it a spot on this list. Compared to some of the best binoculars under 200 it is also lightweight. It weighs only 18.4 ounces making it the lightest binocular on this list so far. Impressively, Vortex has managed to squeeze in a superb optical system in such a compact binocular. Fully multicoated optics allow for more light to pass through the lenses with minimal glare and aberrations. The phase corrected prisms also enhance the optical performance of the binocular. And the optical system is well protected within a rubber armored shell. This means it is waterproof and thanks to its argon purged interior it is also fog proof. Like any other best-hunting binoculars under 200, it has twist-up eyecups that make it easy to use for those who wear glasses and those who do not. In a nutshell, this is a compact and cheap binocular with a fantastic optical performance. 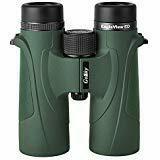 The green colored Gosky Eagleview 10x42 Binoculars are a birdwatcher best companion. They are the priciest on my list costing a few dollars shy off $200. This begs the question, are they worth it considering there are other cheaper offerings? Well for starters unlike some of the cheaper models out there this one has fully multicoated optics. These optics deliver a clearer, brighter and crisp image quality that is rare in most budget binos. Also, the field of view of this pair of binocular is quite good. At 1000 yards you get a 307 ft field of view, which is still more than decent. As a result, it is best suited for outdoor use such as hiking, climbing, and birdwatching. In regards to the quality of its housing, it is completely waterproof and fog proof. The rubber armor that wraps around it is shock absorbent. This helps when you drop it or knock it against something hard. Includes in the package are carrying case, eyepiece and lens protection covers as well as a cleaning cloth. 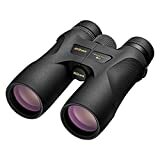 What criteria is used to identify the best budget binoculars from among the thousands of binoculars out there? Personally, there are a number of things I look at. That being the case let us look at what makes up best compact binoculars under 200. There was a time when binoculars priced at below $200 were notorious for being poorly made as manufacturers looked for ways to cut on costs. Thankfully those times are long gone. And as I mentioned in the intro $200 is still a lot of money. Therefore, you should be keen on the kind of binocular you are buying. At the least, your budget binocular of choice should be waterproof and fog proof. There is no point in spending money on a product that cannot withstand a little rain. Also, I recommend going for a binocular with a rubberized exterior. The rubber coating offers a better grip and protects the binocular from the occasional knocks and bumps. Magnification more often than not boils down to preference and what you are buying a binocular for. Some people prefer a 10x magnification while others prefer an 8x magnification. And still, there are those that prefer a more powerful 12x magnification. Whatever your magnification preference is it should match the purpose for which you are buying the binocular. For example for birdwatching the higher the magnification the better. On the other hand, a lower magnification might be better for hunting. The reason being that a high magnification might compromise the field of view. For example, the Vortex Optics Diamondback has a wider field of view compared to the Crossfire. The former has an 8x magnification while the latter has a 12x magnification. Thus if the field of view is important an 8x magnification is best but if you want a detailed view of your target a higher magnification is better. Another component that influences a binoculars’ field of view is the objective lens. Essentially there should be a balance between the size of the objective lens and the magnification. The Vortex Diamondback has a 32 mm objective lens which blends well with the 8x magnification. However, the size of the objective lens will also depend on the purpose of the binocular. A large objective lens means more light entering the binocular. This translates to brighter and clearer images. All the same a larger objective lens also means more weight. More often than not binoculars that have large objective lens will require a tripod. This makes them impractical for hunting. But for birdwatching or star gazing a large objective lens will be beneficial. One area that gets affected as manufacturers try to cut down on production costs is the optics. As such, most budget binoculars disappoint when it comes to the optics. And as is evident from my list not all binocular under $200 have fully multicoated optics. Thus, this is a rather rare feature in this price range but one that makes certain binoculars stand out. Always strive to go for binoculars with fully multicoated optics. However, if you cannot at least go for multicoated optics. In a nutshell, the optics should have some sort of coating. This prevents color fringing while improving contrast and resolution. Generally, the best lightweight binoculars are more suited to hunting as there is more movement involved. For birdwatching or star gazing you can compromise on the weight for a bigger objective lens and more powerful magnification. It’s true that premium features come at a premium. But sometimes all you need is a decent binocular that can help you see things clearly from far off. Thus, you do not have to spend a fortune on a pair of binoculars. Some of the best binoculars under 200 have premium features. As such premium features are not reserved to high paying customers. In conclusion best-hunting binoculars under 200 offer more than what the average $200 binocular offers.